Inexplicata-The Journal of Hispanic Ufology: Mexico: A UFO in San Baltazar Atlimeyaya? 08.13.2016-14:49 - An impressive UFO sighting was recorded at San Baltazar Atlimeyaya, Puebla, on Saturday 6 August at 10:58 p.m. before the startled eyes of nearly 50 people who met to commemorate the 25th anniversary of the Great UFO Wave of 1991 organized by Grupo Volibolo. A startling and unexpected sighting, given that Saturday was overcast and with heavy rains. The rain stopped after 10 o'clock at night. As the cold increased, witnesses saw a shining green object rising through the trees some 200 meters away from their position. The UFO was flying slow at a low altitude and was soundless. It vanished minutes later by simply turning itself off. It was seen later on over some houses near La Cabaña Encantada, a restaurant owned by UFO contactee Paulino López López, who said that some 30 years ago a very beautiful being gave him a substance to scatter on his property, fostering his production of avocados, lemons and peaches. The people watching the anomalous flying object saw it flying scant meters over the rooftops: "The UFO is looking for something," they said. 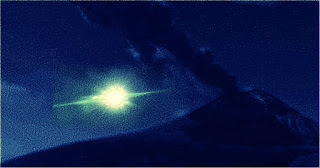 UFO hunter Salvador Guerrero, a dean of UFO research and videography, shot a green laser beam at the object and it responded with a very bright flash of light that astonished those present. Some of them felt fear. "Stop doing it, or it will attack us, don't do it..."
Others, who were leaving a conference that was interrupted by an attendee, who informed the gathering of the UFOs presence, asked: "Where's the UFO?" The interrupted lecture had been the one offered by Miguel Angel Dominguez, who described the unidentified object as "impressive" upon seeing it. The UFO hunters could be heard to say: "Quit shooting the laser at it...it's answering us already." Eduardo Ortega, a UFO hunter with 20 years' experience and nearly 500 videos of these anomalous objects, has recorded them in the vicinity of the Popocatepetl Volcano. That Saturday, August 6, Ortega boasted about his prowess and recorded the mysterious object, which was spherical in shape, white in its middle, and with a greenish-purple hue to its surroundings. When asked about it, he replied: "This isn't terrestrial in my opinion on account of its movements. Not just any object can execute them. It was neither a drone, nor a helicopter nor a plane." He added: "It's quite possible that these beings knew we were here, searching for them in this area where UFO sightings are constant." The incident lasted a total of seven minutes before [the object] vanished into the horizon.